On her new GENUIN CD, featuring music by Richard Strauss and Hugo Wolf, the young soprano Mirella Hagen reveals to us why she has won numerous competitions and why she was able to make her successful debut in Bayreuth. With the Lieder by Ludwig Thuille, both she and her piano partner Kerstin Mörk show that there is much more wonderful song literature out there than anyone can dream of. 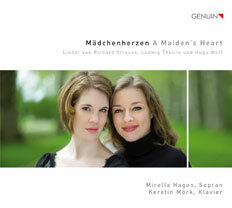 From the serene Hat gesagt to the swirling Waldmädchen, they divulge to us the romantic side of a maiden’s heart. To read the lyrics in German and English please see the PDF. "Recommended without reservation, and the utmost enthusiasm." "Mij zou het niet verbazen." "...this disc is worthy of exploration." "The programming here is great; it makes sense musically, thematically, and historically. The performances are also terrific; Hagen’s voice is silvery, full, and clear and Mörk’s playing is rich and supportive. A great addition to your lieder library."